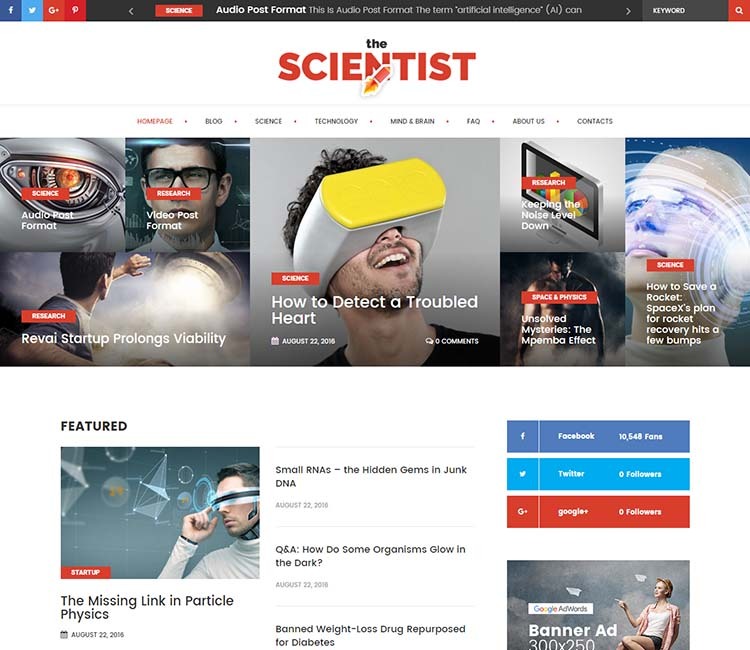 Today we put the best WordPress science and tech magazine themes for 2019 under the microscope. Aspiring publishers looking to build the next Wired or Gizmodo using the WordPress platform will get an inexpensive head start by taking advantage of one of these superb themes. For this article, we selected only themes that invoke a magazine aesthetic and layout. There’s plenty of simpler, minimalist blog themes out there for science & tech blogging, but that’s another list for another day. To keep the list as fresh as possible, we opted to omit themes older than a year from the publishing date of this roundup. You won’t find out of date designs or obsolete usability features on this list. While “best” is subjective, there is a loose, intended order, with our favorite themes occupying the top of the list. The strongest designs and feature sets–amounting to the best value–are given priority. Or maybe you’re looking to sell your own tech & gadgets. If so, check out rundown of the best WooCommerce themes for tech stores. Our number one pick is Flex Mag. This one is one of the best-selling magazine themes of the past year. It’s a multipurpose theme that comes with four niche specific skins. One of those presets was designed especially for gadget and tech magazines. The design itself is professional and strong. The developers have made smart use of modern trends and usability features. Perhaps the most striking and important being nearly invisible: the responsive, snappy performance. Often a theme with this much going on, and themes with complex layouts, do not perform as smoothly. Flex mag supports WooCommerce for shopping cart functionality, and supports bbPress for building forums and communities. The theme is flexible. Layouts, colors, fonts and more can all be easily adjusted on the back-end. Nine different post layouts are included to choose from. The theme’s mobile first design, and retina support, guarantee a flawless user experience on everything from smart phones to the highest resolution desktops. 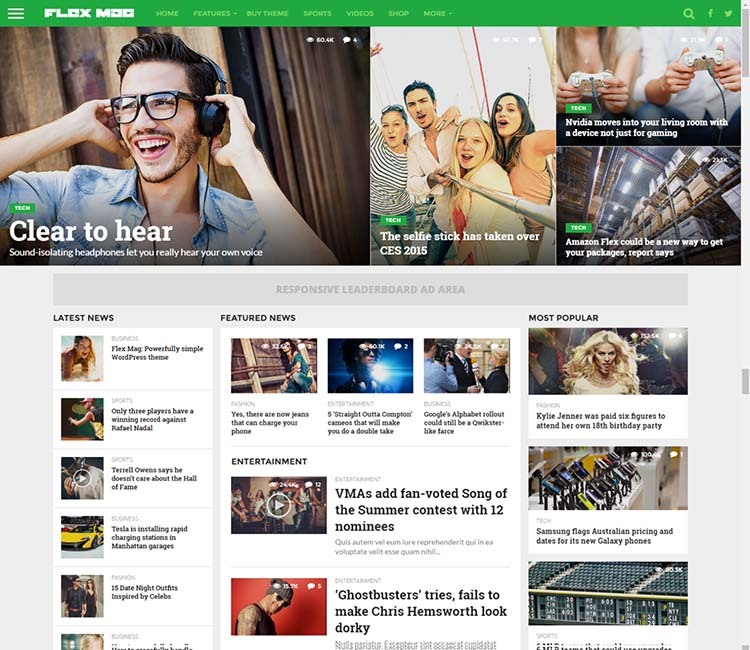 WP portal, like flex mag, is a multipurpose magazine theme that includes a skin tailored toward the tech news websites. The designers take a minimalistic approach, with a content focused design that prioritizes readability. Design-wise, this is our favorite tech magazine theme on our list. The homepages are modular, and a straightforward, intuitive page builder is included for quickly creating and editing new layouts. An advanced theme panel in the admin provides control over colors and fonts. For added versatility and usability, a shortcode generator with 50 shortcodes and nine custom widgets are bundled. WooCommerce is integrated, for putting together an online shop. Unsurprisingly, the theme is optimized the full spectrum of devices, 100% responsive, and retina ready. The search engine optimized code will help you with SEO efforts, an important detail and features that’s sometimes overlooked. The developers tested compatibility with some of the most popular WordPress plug-ins. The theme is often updated and well supported. You’ll start to see a trend here: Urban is another big theme with several skins. 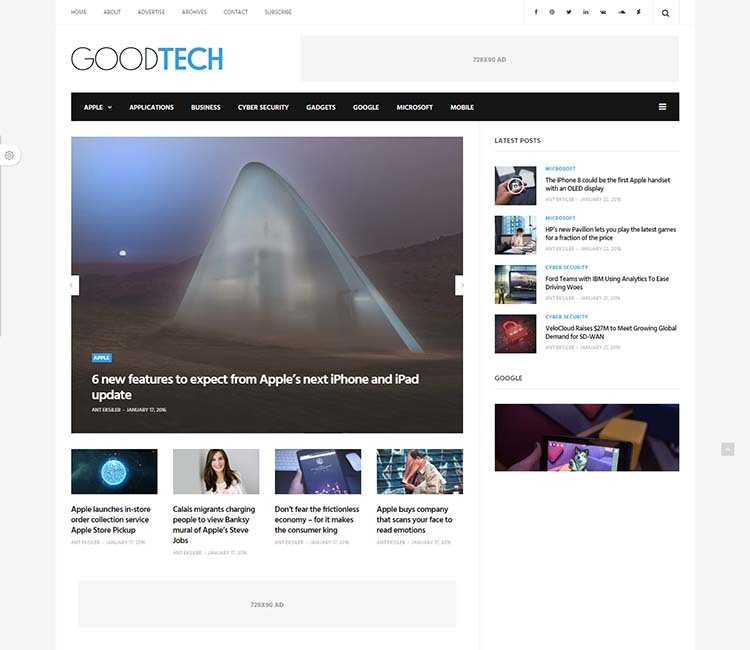 Although not explicitly designed as a tech magazine theme, we think the default style is perfect for a science or technology website. Of course, part of our decision is based on superior UX (user experience) of Urban. We’ve also been longtime fans of the developer, GoodLayers, in general. Their themes prominently feature on several of our other WordPress roundup posts. I promise that’s not shilling – we’re just fans. Urban Mag streamlines features. It includes a drag-and-drop page builder, and a comprehensive options panel lets you tweak the elements and assists with branding efforts. 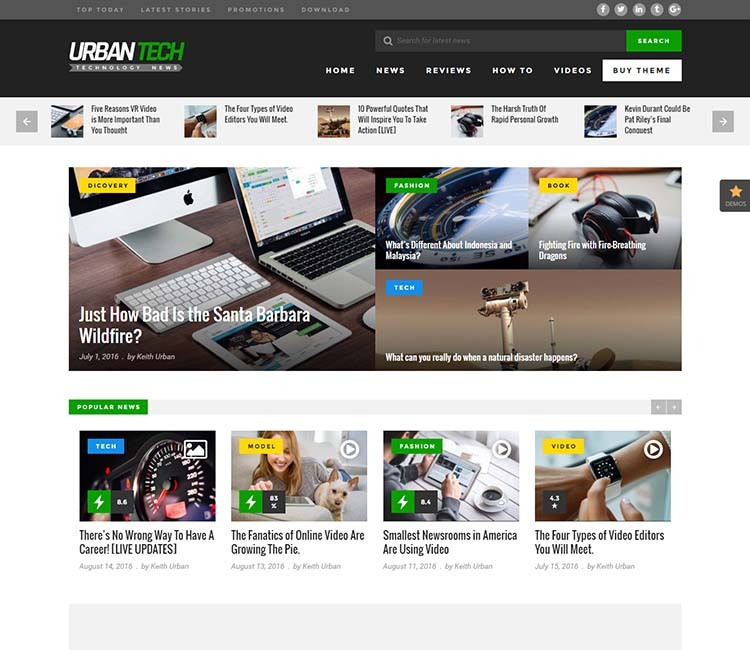 Urban provides mega menu functionality, and offers seven blog layouts to choose from. Obviously, the must-have stuff is here too, like high-resolution capability and SEO optimized code. And I suppose it’s worth mentioning that Urban is additionally WooCommerce friendly. 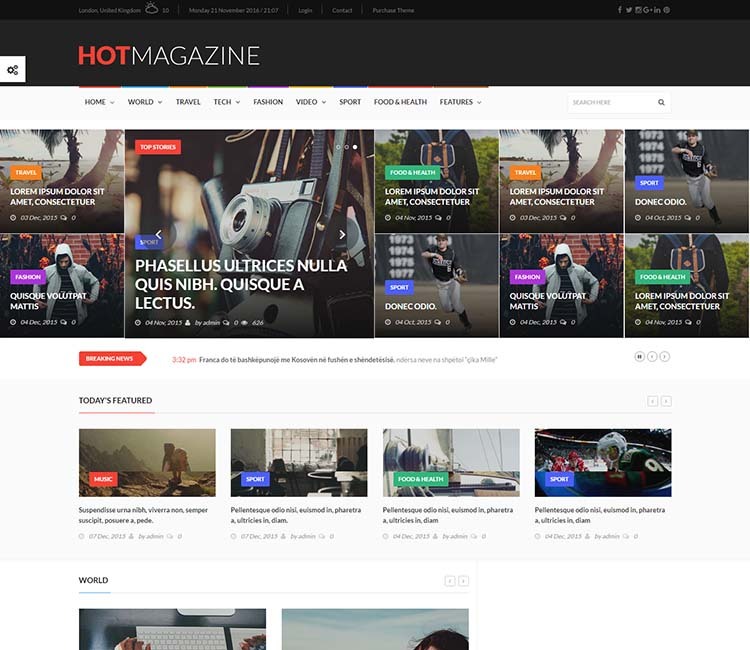 Hotmagazine is one of the most popular magazine themes of the year. 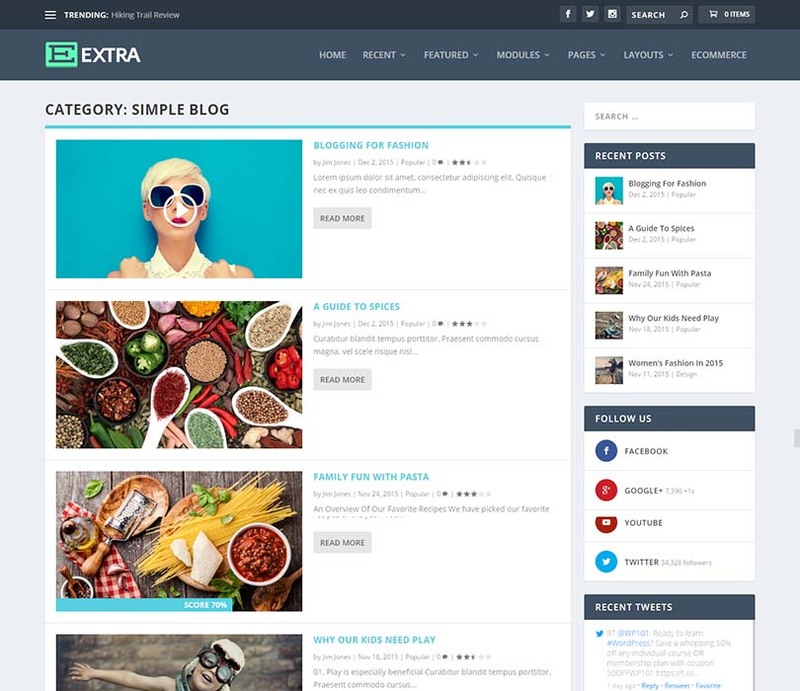 This huge theme serves up 17 different homepages. Nine distinct demos are selectable out-of-the-box, and it should come as no surprise that one of those demos is carefully crafted for technology, IT, and gadget websites. One-click demo install makes each of these a cinch to set up, guaranteeing a quick and painless launch. Advertising is supported, an often underdeveloped feature within premium tech magazine themes. Hotmagazine comes with an excellent review feature (award stars, points, or percentages). A couple other notable features: support for Facebook and Disqus comments, and bbPress styling for forums. Contact Form 7 and MailChimp are fully supported. Translation ready. If you landed on this article from Google, looking for science magazine themes, this is probably closer to what you had in mind than everything else I’ve shown you so far. The creativity lacking from the name is more than made up for in the design itself. To describe a theme as clean and modern has become somewhat of a cliché, but the shoe fits. Plenty of white space and content-focused design add up to high readability and a superior UX. Its fast, responsive performance improves usability even further. Webmasters who prefer not to touch the code will appreciate the comprehensive options panel. Unlimited colors are available and the typography can be fully adjusted. Further versatility comes courtesy of a few custom widgets, a page builder, and plenty of shortcodes. MailChimp and Contact Form 7 support is baked in. Built on Twitter Bootstrap, easy to install, and thoroughly documented. 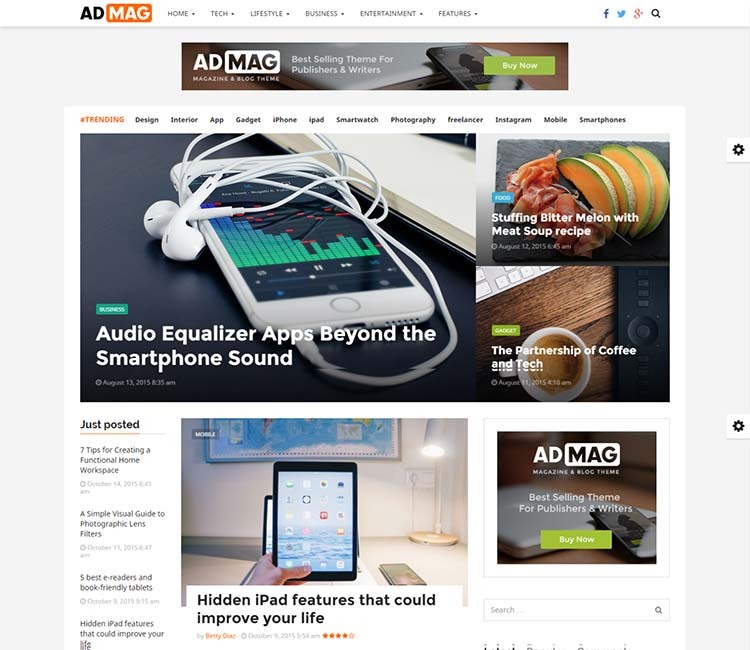 Another multi-skin theme for WordPress tech magazines, AdMag is a streamlined, no-nonsense product perfect for users who don’t want to get too complex. This one can be pared back to work as a simple blog, or Visual Composer (bundled free) can be used to build advanced layouts. The mobile first design ensures a seamless user experience on all devices. A couple of extras like an AJAX mega menu and review system add more value. There’s lots of options on the back-end to adjust colors and fonts, as you might expect. Four headers and three footers offer up even more flexibility. A built-in, intelligent advertising system helps the theme live up to its name. Note: this theme features smooth scrolling in chrome and Opera browsers. This is an acquired taste, and we recommend taking a look at the demo to get a feel for it. 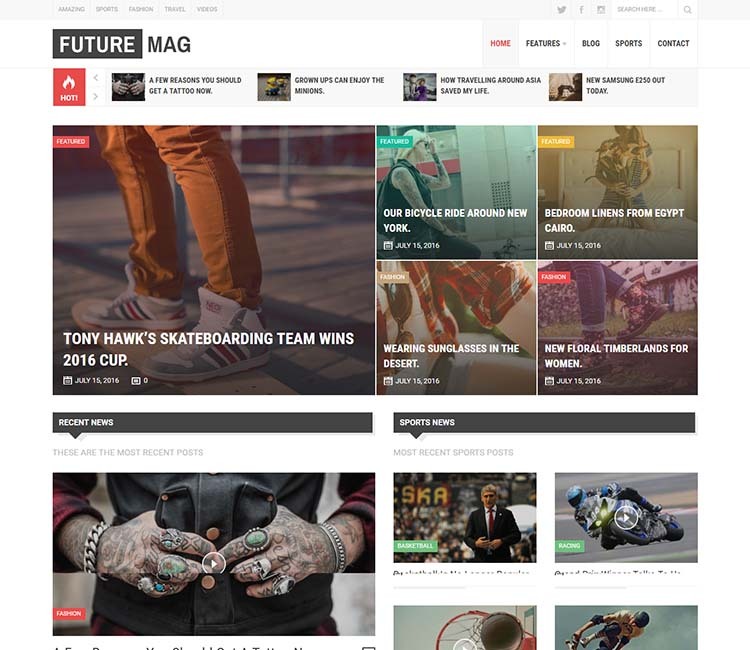 Next up: FutureMag. 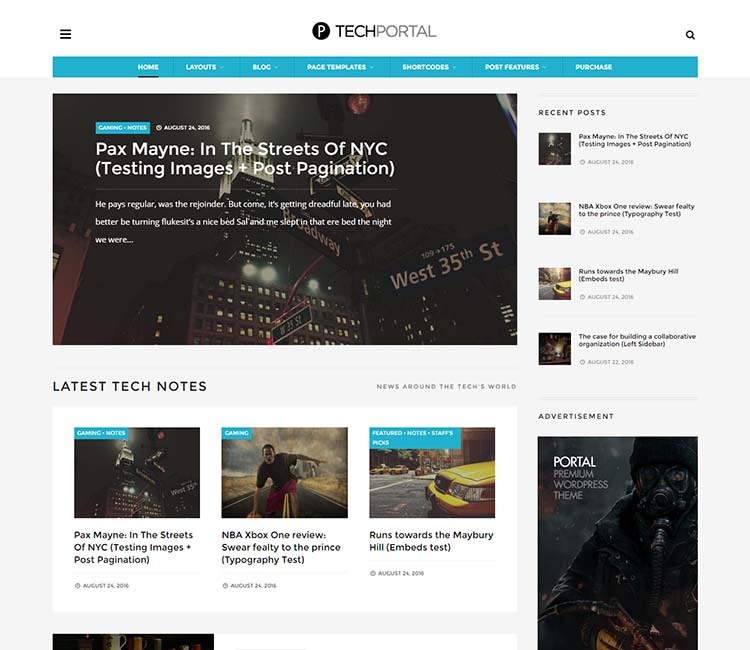 This is a responsive magazine theme that isn’t specifically for tech websites, but lends itself to that use nicely. Featuring a classic WordPress magazine UX, and a light selection of must-have features like a settings panel (based on the Options Framework) and mobile-ready design. Future mag supports Contact Form 7 and is easy to get going with included XML demo content. That brings us to another science magazine theme. 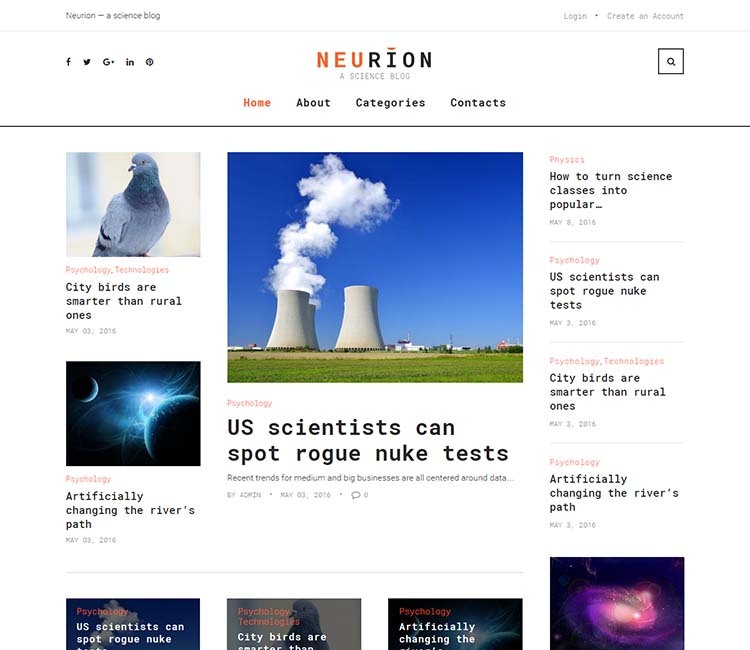 The distinct look of Neurion makes it a standout on our list, and we know it will instantly win over a few of our readers who aren’t necessarily looking for contemporary – and sometimes overused – design trends. This mobile friendly, Bootstrap-based theme features typewriter-style serif fonts in its default state, but that can easily be changed to any one of 600 Google fonts in the theme options. The options are powered by WordPress’s own Live Customizer, for real-time previewing of the changes you make. The theme is built on a solid foundation of Twitter Bootstrap 3 and valid, well documented code. It’s retina-ready, so it’ll look crisp and spiffy on all those expensive, high-end displays. Neurion was released a few months ago, and we feel it hasn’t been getting the attention it deserves. We encourage interested readers to take a closer look. Let’s take a look at one more multipurpose theme before we wrap things up. With almost 1500 sales since launch, Goodlife wasone of the most successful magazine themes on the ThemeForest marketplace this year. Again, this is a theme with several different skins and looks. One skin is tailored to gadgets and tech, inspired by sites like Mashable and The Verge. The layouts are flexible, with five presets for articles, four gallery layouts, and three different styles. Good life also packs in some premium plug-ins for free. Among them: Visual Composer, Essential Grid, Rankie, Maintenance Pro, and Viral Quiz Builder. Social integration is strong, and this is another theme with excellent advertising functionality. Make money, get paid. It’s optimized for speed and search engines, helping you to secure one of those lucrative top spots Google. It’s tirelessly supported, frequently updated and well-documented. Finally, we thought we’d throw Extra by ElegantThemes into the roundup. You might already be familiar with this company, considering their legendary reputation, and you might even be familiar with this theme. It’s not specifically a gadget or tech magazine theme, but it is versatile enough to work for almost any niche or industry. ElegantThemes have a remarkable way of creating designs that age wonderfully. Whereas many premium WordPress themes – even some on this list – may begin to look dated a couple years from now, ElegantThemes’ work tends to stand the test of time well and resist sameness. A quick look at their catalog will illustrate what I mean. Thank you. Urban tech seems to be a nice fit for my tech blog. Thank you for the list. Urban seems like the best theme for me.